The overall Large Group Process project encompasses workshops from Canada, Netherlands and Scotland, and some of the learnings from similar Australian workshops. 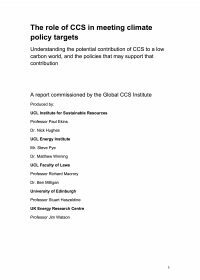 The project is designed to identify public perceptions, acceptance of CCS in relation to other energy technologies; determine demographic, psychological, and environmental influencers to accepting CCS and record results into a report, comparing similarities and differences across countries. This report reflects the Canadian citizens’ perspectives on climate change and low emission energy technologies and how these perspectives may have changed after receiving and discussing objective information. The report present participants’ environmental profile, stated beliefs, knowledge and attitudes, support for different energy technologies, and environmental behaviours and intentions, derived from questionnaire answers and observations during the workshop. The report also presents observed changes on the above over the course of the workshop. To enable comparison of the outcomes, the study’s methodological set up and analysis, as well as the structure of the reports, resembles the Large Group Process approach developed by CSIRO. The methodology for the research is described, and the results presented based on quantitative and qualitative data sources, and provide an analysis and conclusions.